ISBN 9790006533510. 31 x 24.3 cm inches. Key: Key: e-flat major. Text Language: German/English. 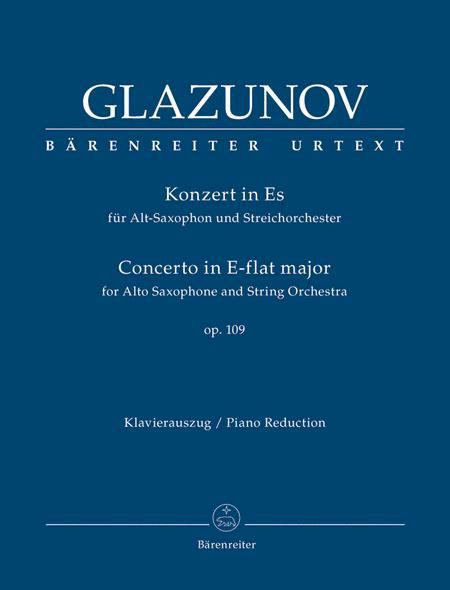 The Concerto for Alto Saxophone and Orchestra is Alexander Glazunov's last work; since its first performance in 1934 it has become part of the standard saxophone repertoire. The sole surviving autograph manuscript is the hand-written dedication score given by Glazunov to Sigurd Rascher (Rascher was the founder and leader of the well-known and innovative Rascher Saxophone Quartet). This score contains the original version of the work without the alterations which were made in the proofs to the orchestral score as well as the full version of the composer's cadenza which was later shortened. The autograph manuscript also contains some performance markings by Rascher. 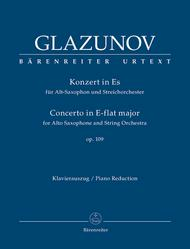 The correspondence between Rascher and Glazunov documents the composer's thoughts on the work and his recommendations about the size of the accompanying string orchestra. Evidence from this correspondence has been integrated into this edition. This first scholarly-critical edition of a work by Glazunov contains an informative introduction with commentaries about the history of its composition, facsimiles and a critical commentary. The solo part includes both the complete and the shortened version of the cadenza as well as a cadenza by Rascher which the composer authorised.